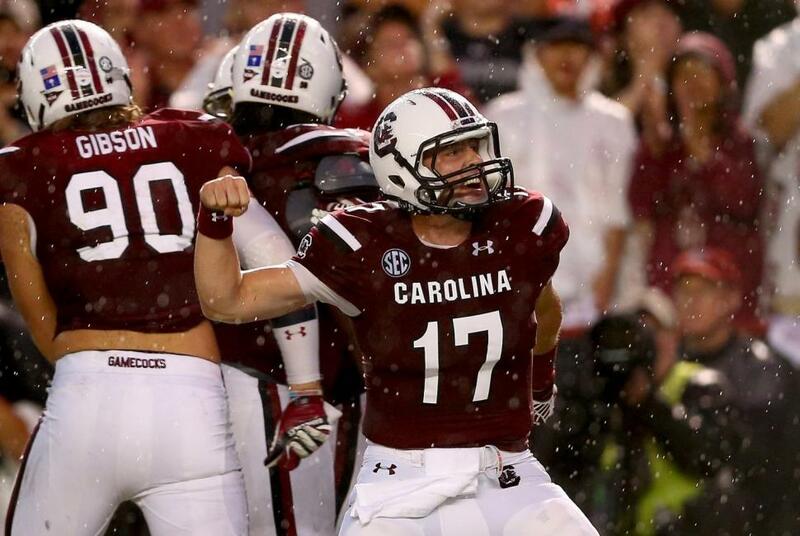 South Carolina QB Dylan Thompson pumps his fist after passing for the first of 2 touchdowns against Georgia. Thompson led the Gamecocks to a 38-35 win over the Bulldogs. After two weeks of great matchups, the only matchup between top 25 teams was the game between the Georgia Bulldogs and the South Carolina Gamecocks. Georgia had moved up to a #6 ranking in the country due to a convincing win over Clemson. It’s hard to say that a game is a must win in week 3, but that really was the case for South Carolina. After an embarrassing blowout loss to Texas A&M, the Gamecocks could not afford a second SEC loss. A loss to Georgia would have effectively put them three games behind the Bulldogs since the Bulldogs would have the tie breaker. This was an entertaining game, but you had to wonder when or if it would even happen. The game was delayed almost an hour and a half due to lightning. Once the game finally got started, each team played well for a quarter and a half. South Carolina seized the momentum in the 2nd quarter to take a 24-13 halftime lead. Both teams scored a touchdown in the 3rd quarter to make the score 31-20 going into the 4th quarter. Georgia made an attempt at a comeback and cut the score to 38-35 with 7:10 left. Georgia corner Damian Swann picked off Gamecock QB Dylan Thompson on the next possession and it looked like Georgia might have a shot to either take the lead or tie the game. However, the South Carolina defense got some redemption from the gashing that the Aggies gave them in week one. On the first play after the interception, Georgia quarterback Hutson Mason was sacked. The defense held and Bulldog kicker Marshall Mason missed a 28 yard field goal. The Gamecocks ran the last 4:24 off the clock and improved their record to 2-1 for the year. Dylan Thompson, QB, Sr: First full year as a starter, although he started some games when Connor Shaw was injured last year. Takes care of the ball. Surprises you with his running ability. A smart player that makes quick decisions. Has good ball placement. Puts good zip on the ball. Has good touch and has the ability to drop the ball into a bucket. Completed 21 of 30 passes for 271 yards, 3 TD and 1 INT. Mike Davis, RB, Jr: Has a slashing running style. Has a combination of size, power and speed. Able to push the pile. Has the ability to make quick stops and starts. Good vision and ability to find small creases. Good hands. Had 66 yards rushing on 17 carries and 2 catches for 16 yards. Brandon Wilds, RB, Jr: Big, powerful back. Good north – south runner. Uses good pad level. Keeps legs churning after contact. Able to squirt through small holes. Runs over tacklers. Has a nice stiff arm. Does a good job as a closer, running the clock out. Led the team with 93 yards rushing on 14 carries and had a 24 yard touchdown run. Caught 1 pass for 3 yards and had a fumble early in the game. Shon Carson, RB/KR, Jr; Had a 42 yard kickoff return that set up the winning touchdown. Shaq Roland, WR, Jr: Uses his 6’1” height and leaping ability to climb the ladder on high throws. Only weighs 176 pounds and could use a little extra weight. Former Mr. Football in the state of South Carolina. Has the ability to accelerate quickly. Caught 4 passes for 47 yards and 1 touchdown. Damiere Byrd, WR, Sr: Fastest player on the South Carolina team. Very good in space after the catch. Had 1 catch for 24 yards, but also had a drop. Nick Jones, WR, Sr: Runs nice routes. Finds soft spots in the zone. Good chemistry with the quarterback Led the team with 4 catches for 87 yards and had a 24 yard reception. Rory Anderson, TE, Sr: Good size. Combination of size and athleticism. Uses his size to shield off defenders and make the catch over the top of them. Tough matchup, too big for corners, but too fast for linebackers and safeties. Tough to bring down after the catch. Likely a top tight end for the 2015 draft. Had 5 catches for 67 yards and had an 18 yard TD catch. A.J. Cann, G, Sr: Plays with good leverage. Stout run blocker. Threw a key block on the 24 yard TD run. J.T. Surrat, DT, Sr: Plays with intensity. Strong at the point of attack. Gets off blocks quickly, then flows to the ball. Tough to run against. Has the strength to push blockers into the backfield. Gets hands up on pass rush. His impact isn’t always shown on the stat sheet. Got a batted ball. Kaiwan Lewis, LB, Jr: Good form tackler. Has ability to stand up the ball carrier and stop them in their tracks. Had 4 tackles. Hutson Mason, QB, Sr: First full year as a starter, but started the last two games of 2013 when Aaron Murray was injured. Knows the offense. Accurate and has a good touch. Good leadership qualities. Good pocket presence. Quick release. Knows how to step up into the pocket and move around to buy time. Had a grounding call in the red zone. Completed 16 of 22 for 191 yards and 2 TD and passed for a 2 point conversion. Todd Gurley, RB, Jr: Probably the best running back available for the draft. Big, fast and powerful. Relentless running style that attacks the hole. Good cutback ability. Breaks tackles and carries tacklers. Able to make something out of nothing. Knows how to change speeds. Very good forward lean. Able to return kicks. Had 131 yards rushing on 20 carries with 1 TD and had a 40 yard run. Had 4 catches for 4 yards. Quayvon Hicks, FB, Jr: Can line up all over and play fullback or tight end. Runs tough with the ball. Had a 25 yard run on 3rd and 1 and then added a touchdown run. Had 3 carries for 30 yards. Michael Bennett, WR, Sr: Good size. Good football IQ. Good all-around football player. Does the little things that make the offense work. Very good blocker and he had a key block on a 33 yard touchdown run. Dependable receiver that makes plays on 3rd down. Had 2 catches for 22 yards and had a 2 point conversion catch. Jay Rome, TE, Jr: Red zone threat. Snatches the ball with his hands. Able to catch the ball at its highest point. Had 1 catch for a 5 yard touchdown. John Theus, OT, Jr: Good movement skills. Able to get to the second level and block linebackers. Called for 2 false start penalties. Ray Drew, DT/DE, Sr: Able to play as a 3-4 defensive end or line up inside and rush the passer. Able to push the pocket while rushing the passer. Had 1 tackle and 1 QB hurry. Amarlo Herrera, ILB, Sr: Always around the ball. Closes quickly to the ball. Good A gap blitzer. Had 11 tackles, 1 tackle for loss and 1 sack. Ramik Wilson, ILB, Sr: Flies to the ball. Wraps up well. Led the team with 13 tackles and 2 ½ tackles for loss. Damian Swann, CB, Sr: Does a great job reading the quarterback and breaking on the ball. Good in run support. Had 8 tackles and an interception that gave his team the ball in the red zone late in the game. This entry was posted on September 17, 2014 by draftmaniacs in Uncategorized and tagged 2015 NFL draft, A.J. Cann, Amarlo Herrerra, Brandon Wilds, Damian Swann, Damiere Byrd, Dylan Thompson, Georgia Bulldogs, Hutson Mason, J.T. Surrat, Jay Rome, John Theus, Jordan Jenkins, Kaiwan Lewis, Michael Bennett, Mike Davis, NFL, NFL Draft, Nick Jones, Quayvon Hicks, Ramik Wilson, Ray Drew, Rory Anderson, Shaq Roland, Shon Carson, South Carolina Gamecocks, Todd Gurley.